Use an inline water filter to ensure clean-tasting water and reduce mineral deposits in the water system. 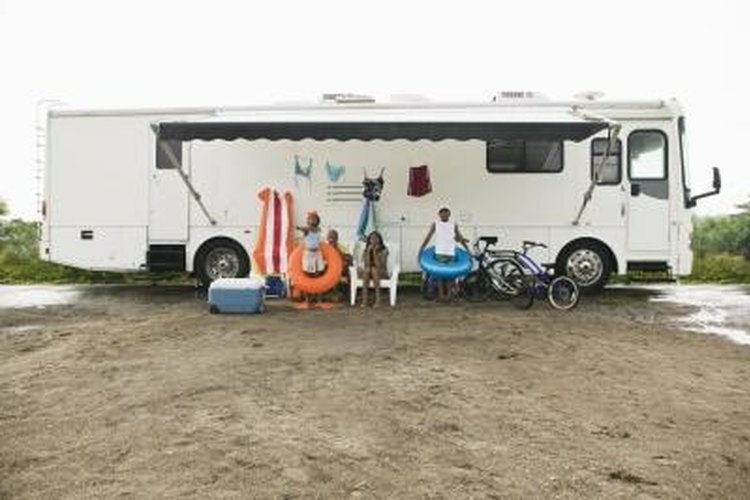 While traveling in your RV, you will need to find solutions for laundering clothing and towels. If you prefer to line-dry some of your laundry, a portable drying rack can be constructed from sections of PVC pipe. This inexpensive solution attaches to the ladder of your RV and is ideal for air drying bath towels between uses. It can also be disassembled to store between uses. Measure and cut the PVC pipe into sections of these lengths: 2 pieces, 2 inches long; 2 pieces, 3 inches long; 2 pieces, 22 inches long; 2 pieces, 28 inches long; 3 pieces, 7 inches long; 4 pieces, 8 inches long; 4 pieces, 12 inches long. Glue a 90-degree elbow to each end of both of the 28-inch sections of PVC pipe. Drill holes approximately 4 1/2 inches apart through the two sections that are 28 inches in length. Glue a tee joint to the end of a 12-inch section. Insert and glue a 7-inch section into the tee joint. Glue a tee joint onto the other end of the 7-inch section. Insert and glue a 12-inch section into the tee joint. Repeat this step to form the fourth side of the base. Connect the four sections to form a rectangle. Do not glue these sections. This will allow the drying rack to be disassembled for storage. Tie a knot in one end of the clothesline. Pull the line through the first hole and thread it back and forth between the two PVC pieces. Glue an end cap to a 2-inch section. Use a 90-degree elbow to join the 2-inch section to a 3-inch section. Add a tee joint to the end of the 3-inch section and glue all joints. Repeat this step to form two ladder hooks. Insert the 24-inch PVC sections into the tee joints on each ladder hook. Attach to the tee joints on the back of the base. Insert the 22-inch PVC sections into the tee joints on the front side of the PVC square. Glue a tee joint to the ends of the 22-inch sections. Place an 8-inch section in each tee and attach a 45-degree elbow to the end of each 8-inch section and glue the joints. Use the 7-inch section of pipe to join the remaining two tee joints. Hang the ladder hooks over a rung on your RV’s ladder to use the drying rack. Disassemble at the unglued joints for easy storage.